It is a unique museum since it contains cartoons for the frescoes which decorated the famous Camposanto complex in Piazza dei Miracoli. 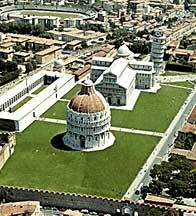 In that museum you can see the busts which were located in the Baptistery, the works of art by Nicola and Giovanni Pisano and the so-called tesoro del Duomo (Cathedral's treasure). Located inside an ancient Benedictine monastery, the museum contains works by artists such as Giovanni Pisano, Andrea Pisano, Simone Martini, Giunta Pisano and Maestro di San Martino. The fortress, which dominates the city, is formed by the ancient fortress and the modern fortress dating back to XIV and XV century respectively. The Roman theatre dates back to the end of I century B.C. . Today you can see the proscenium, the cavea and the portico.